You’re working in pastoral ministry. You’re really busy. You have about 15 hours of work to try to get finished in the next hour, but you are hoping that having your fifth cup of coffee for the day will get you there. Hopefully that’s an exaggeration. But if you’re in pastoral ministry, chances are that you have developed some unhealthy habits of life, both practical and spiritual. These can only hinder you at best, and can even prevent you from persevering in ministry. You need to engage with this reality and the sooner the better. Crossway. 208. FREE in April (Audiobook). But you’re busy so I’ll get to the point of this review. 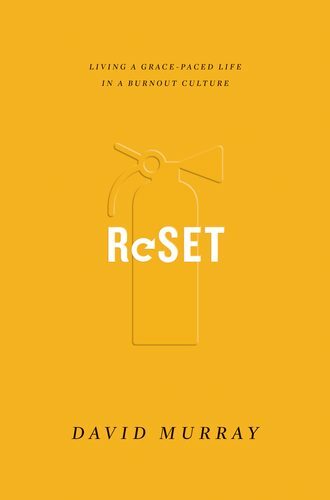 David Murray’s Reset is a wonderful book and you should read it. It is particularly aimed at men and especially for men in ministry, but it would be useful for anyone. It is also the free audio book download of the month (April 2018) at christianaudio.com. So download it and listen to it in the car. I’m confident that you’ll benefit enormously. The book is arranged as a series of “repair bays”. The premise is that you are a finite, created being. Just like your car you need regular servicing and repairs to keep running well long-term. Murray takes you through a series of check-up areas with the competence of an experienced automotive mechanic: warning indicators, sleep, exercise, sense of personal identity, self-assessment of areas of gifting and of weaknesses, relationships, and so on. Each chapter is practical and repays careful personal reflection. This is a book to reflect on and to come back to time and again. However, it is not merely a book of practical tips. What I appreciated about this book is not only how practical it is but that it is thoroughly biblical, grace-centred, and Reformed in theological orientation. This is crucial, since different underlying beliefs would lead to promoting different work practices. Murray believes in the sovereignty of God and God’s gracious care of his children. Grace isn’t just a concept for evangelistic preaching, but the character of all of life, including ministry. The book is shot-through with these affirmations. Without holding to these convictions, following Murray’s practical advice is more difficult since it is hard to justify. Without grace, we people-please and construct our own identity. Without believing in the sovereignty of God, ministry actually is all up to us, so habits of rest become harder to justify. And so on. The book shows how belief in sound theology informs issues of self-care and makes it possible for weak, fragile human beings like us to serve God long-term. It’s when we try to serve and live as though we are strong and self-sufficient that we run into problems. One of the book’s main exhortations is that we will either rest and repair in a good way, or it will be forced on us eventually by breakdown. That is an ugly alternative that should be avoided. It is bad for you, bad for the church, and bad for the ministry of the gospel. This is a deeply necessary book for today. Read it, listen to it, reflect on it, and persevere in serving the Lord Jesus long-term.